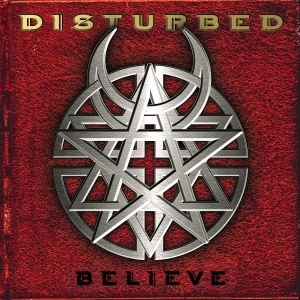 Believe is the second album by nu metallers Disturbed. Following the massively successful release of The Sickness, you could have easily expected Disturbed to follow up in a similar fashion but that isn’t the case because they have chosen to shed off many of their defining traits to start on a new path for Believe. The confrontational singing style and angsty lyrics have been scrapped in favour of highlighting David Draiman’s highly melodic singing abilities with his lyrics now taking a closer look at religion and spirituality, which is also depicted on the albums cover as a mix of the Christian crucifix, Islamic crescent, Jewish star of David and a Wiccan pentacle. The only song on Believe to feature any of his distinguishing barking noises is Intoxication so for anyone that is put off by that on The Sickness will find Believe much more welcoming. The electronic elements have disappeared almost entirely with the tiny exceptions being the glitchy vocals at the start of Liberate and then the keyboards at the start of Remember and on the bridge of Mistress. Another rare moment is the final song, Darkness, which is an artfully crafted piano ballad that will catch most listener’s off-guard. It also proves that the band is capable of expressing themselves in an entire different way when they want to. It also happens to be the only song to feature an acoustic guitar as well as cellist Alison Chesley. Devour picks up a lot of momentum right at the end before coming to a sudden stop and it’s hard not to think that this could have easily transitioned into a new verse or even something slightly progressive but instead of tip-toing around something new Disturbed strictly adheres to their radio friendly format. That isn’t to say that there is anything inherently wrong with this, despite it almost feeling intentional at times, but it would have been interesting to hear the band tackle something more challenging. Despite the sudden shift into a highly accessible and melodic style, Believe is still a nu metal album that focuses on straightforward guitar riffs and stays away from any form of flashy showmanship. In contrast to this, the rejection of angsty lyrics and aggression in general makes Believe one of nu metals most mature efforts by the simple virtue of escaping these common elements. Whether you consider Believe to be a streamlined or a stripped back effort will depend entirely on your perspective of the band and the subgenre.